Valentines Day often means candy, and candy can be bad for our dental health. If you and your children indulge in sugary treats, do so wisely, with moderation, and be sure to brush and floss afterward. 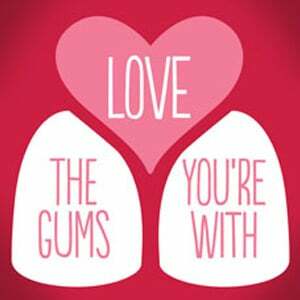 Valentines Day is a good time to teach your kids about good oral hygiene and healthy diet choices. Having said that, there are many treats and gifts which do not involve candy. For starters, remember fresh fruit. A shiny red apple is a delicious and healthy snack. In keeping with this red theme, treat the family to strawberries, raspberries, or cherries, but be sure to watch out for pits. Use a cookie cutter to shape slices of watermelon (or other fruit and veggies such as pineapple or tomato) into heart shapes. For other great Valentines Day ideas, think arts and crafts. Valentines Day provides an opportunity to spend quality craft time with your kids. One obvious and fun choice includes making Valentines Day cards. All it takes is colored paper, markers or crayons, pictures from a magazine, and glue. Or kick things up a notch by downloading a printable Valentines Day card template from the internet. Instead of bags of candy, make small bags of toys (such as dinosaurs or kittens). You can even create your own fun Valentine labels for the bags. Gather heart-themed costumes, balloons, or other props. Then take Valentines Day family selfie photos and compile them into a storybook. One of our personal favorite activities is to decorate “character bananas.” Use miniature costumes and props, which can be made from construction paper and toothpicks, and decorate the bananas (in their peels). For example, give them eyes, lips, a hat, sunglasses, and a big construction paper heart. Be creative. After the kids have a little fun with their characters, peel and enjoy the bananas. Valentines Day gift options include books, clothing, or flowers. Plus, don’t forget the tradition of giving (and receiving) cute stuffed animals — may be a Valentine teddy bear. Finally, if your family is ready to take on the responsibility for its care, consider a real puppy or kitten for Valentines Day. That’s a gift that should brighten your kid’s smile. We hope these ideas help you make the most out of your Valentines Day. Remember, beautiful, healthy smiles are a family affair. Dr. Ted Herrmann and Assure A Smile have served South Florida for over 25 years, helping to guide patients to better oral health for life. We are a family friendly dentist, offering a full range of quality dental care, such as routine cleanings, crowns, Invisalign clear braces and more. We encourage a unique holistic approach to healthy teeth and gums. We invite you to call us today and schedule an appointment.